You hopefully read last October’s blog post on visualising available data on the collecting history of Leadbeater’s Possum in the context of competing demands for its habitat. Heres another gauntlet thrown down by Piers: assemble a GIS tiger team for fifty hours to explore ‘what can you do help people visualise readily available spatial data for a significant group of organisms in their particular area of interest AND let them download a field guide for just those taxa’. Barbara and Jake G. tackled the spatial side of the question while Jake T. explored ways to transform the resulting data into a well-formed PDF document. The Atlas of Living Australia (ALA) was the first choice as they provide an impressive range of web services to programmatically access and harvest their aggregated data. Here’s what the team came up with (illustrated below). Drawing on large data sets presents its own issues, and there are some 750,000 fungi specimen and observation records available in the ALA. For query and presentation responsiveness we chose to limit the query to just one large order in Kingdom Fungi – the Agaricales. Similarly, limits to the number of records retrieved (500) were also implemented in case the area drawn is very large. Currently, the tool is aimed at medium-size areas, such as Bold Park, a coastal conservation reserve in Perth, as illustrated below. The interface we developed (with one of the field guide PDF files overlaid) – click on the image or here to try it yourself. each table row ideally contains a referenced image (so that you can follow up on the creator and usage information), scientific name and author, family, and the contributing dataset. This project provides an informative case study for producing useful products from authoritative public datasets. It could be expanded upon and further configured to produce field guides for any major taxonomic group. Given more time we would have liked to add to the map point clustering and record counts, and a dynamically generated drop-down list of only the families occurring in the defined area and we’d really like to do more on attributing those images properly! We uncovered some technical issues also, such as repeated 404 timeouts with retrieving ALA data, and noted the lack of map tile services at the scale required. Similarly, the species-level data is uneven, with a lack of representative images or descriptive text to better meet the real-world requirements of a Field Guide. We also need to check through some of the delivered data in more detail – some of the data we receive appears to be getting truncated along the line. Never-the-less, given the fifty person-hours available, we are quite happy with this result! 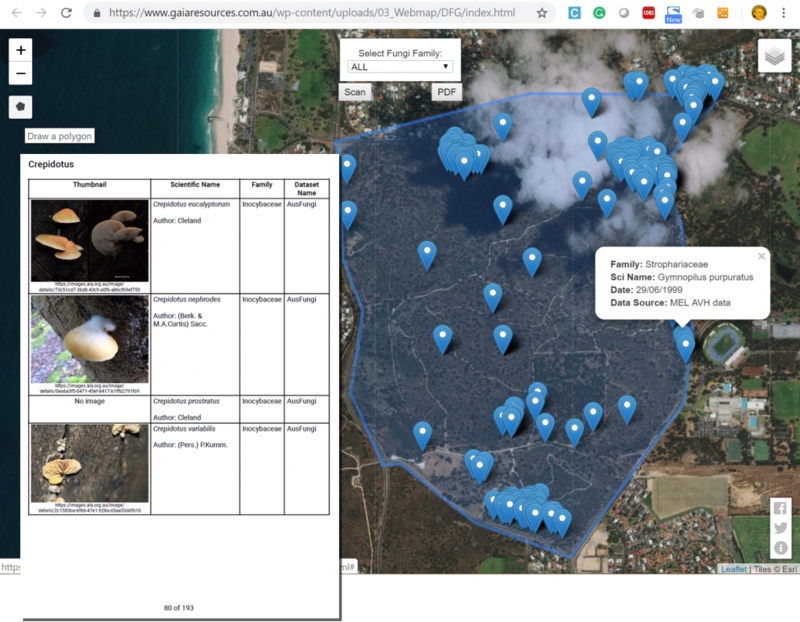 We’d like to acknowledge the ALA for its continuing commitment to aggregating the scientific resources to provide a national view of Australia’s biodiversity, and the RBG Victoria’s FungiMap project, which has contributed much of the data we have harvested for this project. If you’d like to give us your feedback on the webmap, or know more about how we can help you with research programs, data management or spatial information systems, then please leave a comment below, start a chat with us via Facebook, Twitter or LinkedIn, or email me directly via alex.chapman@gaiaresources.com.au.